Eating healthy can be simplified when taking prescription warfarin, once you know which foods contain vitamin K. Several foods interact with this medication — including fruits and vegetables that provide vitamin K.
Vitamin K is a nutrient that makes the clotting factors responsible for thickening the blood — and can negate warfarin's blood-thinning effects. Knowing which fruits contain vitamin K can help you eat consistent amounts in your diet and allow warfarin to work effectively. The recommended adequate intake for vitamin K for is 120 and 90 micrograms for adult males and females, respectively. Vitamin K is essential for good health, but when taking warfarin, you need to be aware of the vitamin K content of various foods and limit those that contain high amounts. 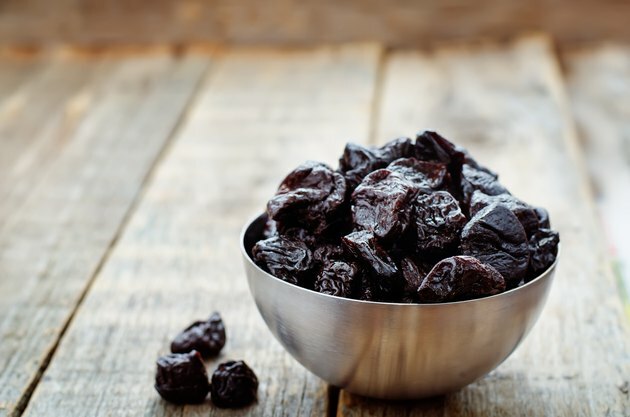 A 1-cup serving of prunes, or dried plums, is the highest source of Vitamin K among fruits with a total of 103.5 micrograms, or 129 percent of the recommended daily value. Plaintains are the second highest at 77.8 micrograms per 1-cup serving, followed by kiwifruit at 72.5 for 1 cup. Other fruits that are moderately high in vitamin K include cooked rhubarb, avocados, blueberries and blackberries. There are several fruits that have no vitamin K that would interact with warfarin. You can eat citrus fruits and juices, including tangerines, oranges and clementines, without side effects. Grapefruit also contains no vitamin K but is known to interact with many medications, so make sure to check for interactions with other medications you may be taking. Other fruit options that contain very little vitamin K include watermelon, apples, pineapple and bananas, and fresh or canned cherries, pears, peaches and papayas. Fruits can provide a significant amount of vitamin K, but it's also important to monitor vegetables when taking warfarin. Green, leafy vegetables are some of the best sources of vitamin K and can provide more than 200 percent of the daily value. Consume no more than a half-cup serving each day of leafy greens like kale, spinach or collard greens. A half-cup serving of Brussels sprouts or 1 cup of lettuce and broccoli also provides a significant amount of vitamin K and should be limited to three servings or fewer each day. To ensure your medication works effectively, eat consistent amounts of vitamin K each day. For example, if you like to eat fruits like berries, kiwifruits or avocados or dark green vegetables, make sure you eat some every day. A sudden increase or decrease in the amount of vitamin K can change the effect warfarin may have on your blood. Grapefruit juice and cranberry juice are sometimes of concern to patients taking warfarin. However, recent studies indicate that consuming 4 to 6 ounces of cranberry juice doesn't cause significant interactions. However, in regard to grapefruit juice, you may want to be a little more cautious. Always report any changes in your diet to your physician and get your recommended regular blood testing to help you and your doctor monitor how warfarin and your diet are working together.